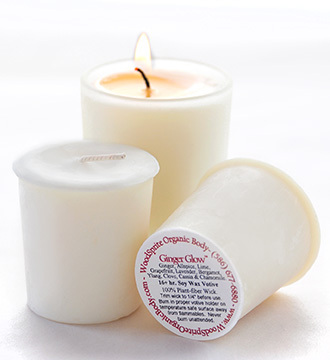 Ginger Glow is our warming blend of ginger and other spices commonly used in aromatherapy to increase blood circulation and relieve the effects of muscle tension, stiffness or rheumatism. Pure Essential Oils of Lavender, Bergamot, Ginger Root, Clove Bud, Allspice, Lime, White Grapefruit, Roman Chamomile, Cananga & Cassia. 100% Plant-Fiber, Unbleached Wick. 16+Hour Burn.